Learn how easy it is to get started in communicating with animals yourself! You know your animals have secret thoughts, feelings and wisdom… Wouldn’t it be great if you could learn how to hear, understand and communicate with them yourself so they share their innermost thoughts with you, heart to heart, mind to mind? Learning How to Talk With Animals is a critically important skill that any animal lover can learn – if they want to. You know that you can easily misunderstand your animals when you don’t know how to speak their language or consider their viewpoints. Did you also know that not knowing how to communicate with them directly can get you into sometimes awful predicaments, and can even cost your animal it’s life? Because your animals reflect your own imbalances, wounds and issues, they are your best teachers and healers. Learning how to work with them and connect at deeper levels helps us all be better people – more balanced, kind and considerate; helps us be healthier and clearer about who we really are and what we need and want; and can completely transform the quality of our lives. How often do you find yourself saying…. Wouldn’t it be amazing if it was quick and easy to find out what my animal is thinking? I wish I knew how to communicate with my animals myself! How does animal communication actually work? Can’t someone just explain it to me Step By Step? Are there practical tools, tips and techniques I can put to use right away with my animals? 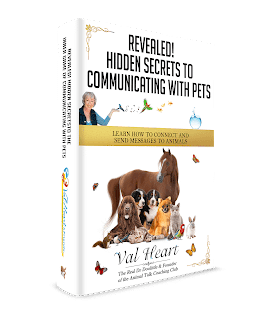 Val’s Step 1: Introduction to Animal Communication gets you started right away. And you don’t even have to wait for a live class because this 60 minute course is digitally recorded so you can access it now. The 3 simple steps to communicating with animals! Learn how to quickly and easily connect with animals! Why being an effective listener is so important! The SECRET KEY to animal communication that every animal lover can use! This is one of Val’s most popular classes! And, it’s a great place to start discovering your own telepathic abilities, communicating with your animal companions. The practical information can be put to good use right away! And it’s recorded so you can listen and learn on your own schedule. $27 USD – Purchase Now for Immediate Access and Start Learning How to Talk with Animals Now!